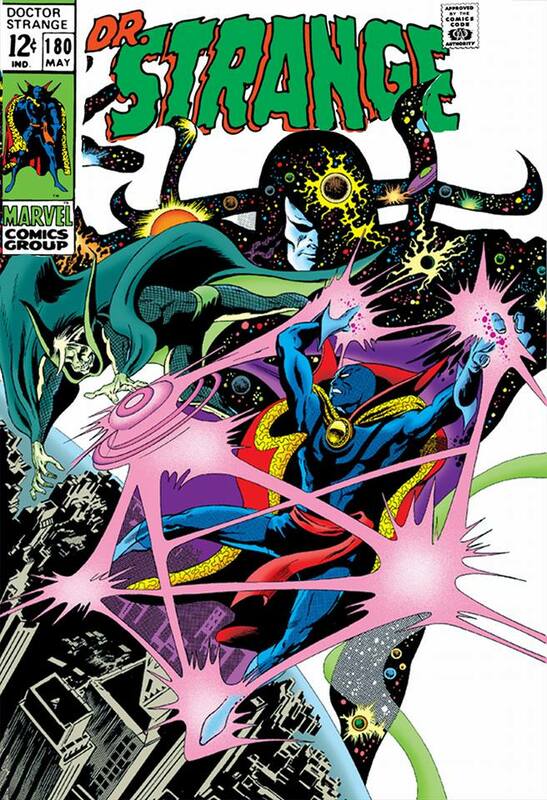 But the next issue of Doctor Strange to hit the stands after Avengers #61 was a reprint, featuring the good Doctor’s “old look” — though, since it was a reprint of a classic tale by Steve Ditko and Stan Lee that co-starred Spider-Man, and which was 100 % new to me, I didn’t really have much to complain about. 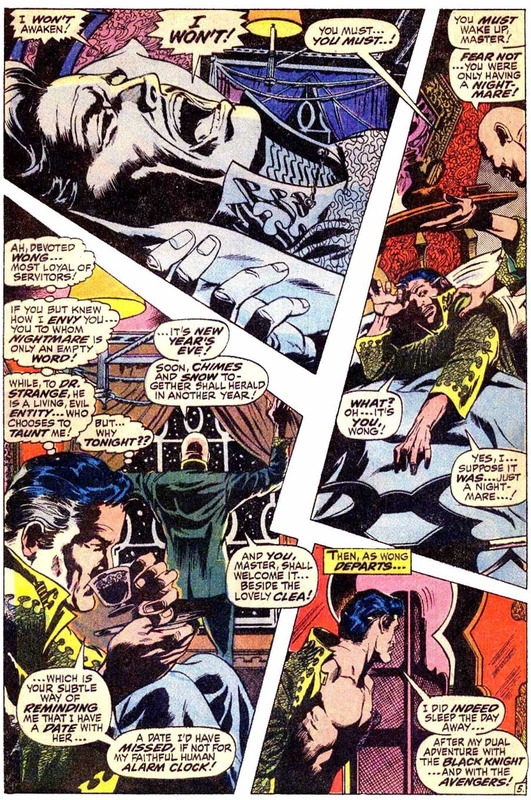 Still, I was happy to see Doctor Strange #180, the “real” follow-up to Avengers #61, when it finally arrived in early February, 1969. 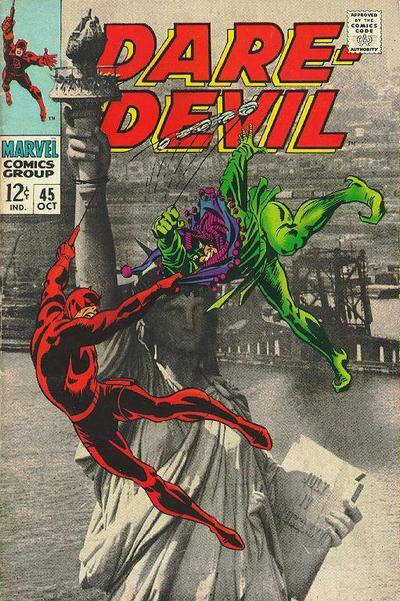 The cover might have struck me as somewhat unusual, but probably didn’t — after all, I’d seen at least one other Marvel comic whose cover featured two dawn figures against a photo backdrop (namely, Gene Colan and Frank Giacoia’s Daredevil #45, shown at right). 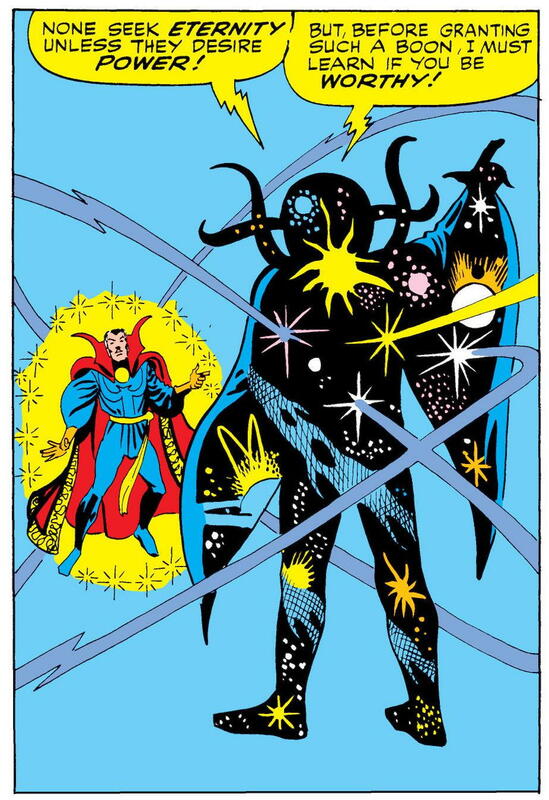 I did probably notice that the posing of Doc Strange’s figure looked a little odd, but I doubt my eleven-year-old self thought twice about it afterwards. 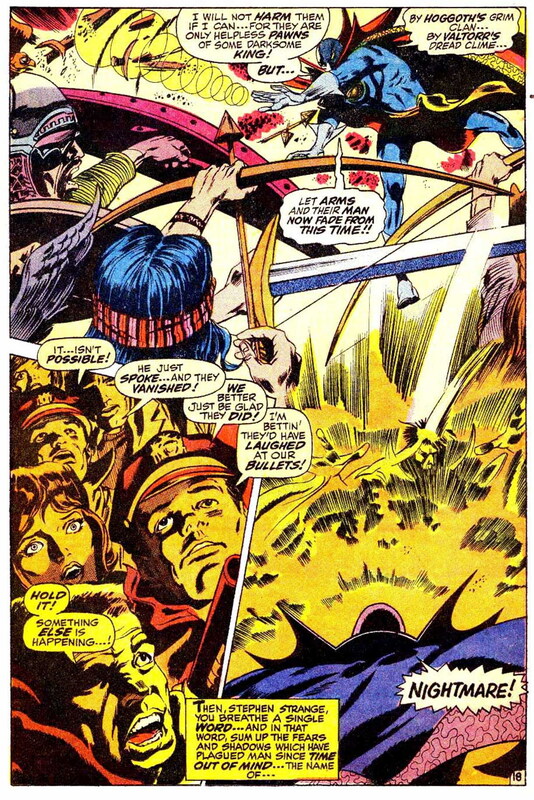 What I didn’t know at the time, of course, was that the original Gene Colan – Tom Palmer cover that had been intended to grace issue #180 had been lost in the mail. 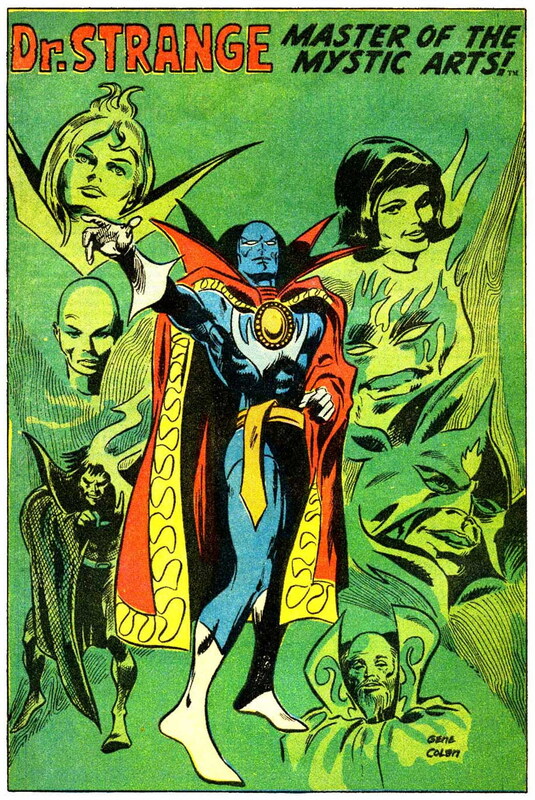 When that happened, Marvel’s production staff had to cobble together a replacement at the last minute; and so, an old Ditko illustration of the cosmic entity Eternity from Strange Tales #146 (see left) was reworked and extended; then combined with a similarly altered Colan-Palmer figure of the titular hero of Doctor Strange #178 (see detail image at right); and then both were superimposed over an aerial photo of New York City. Not bad at all for a last-minute save. 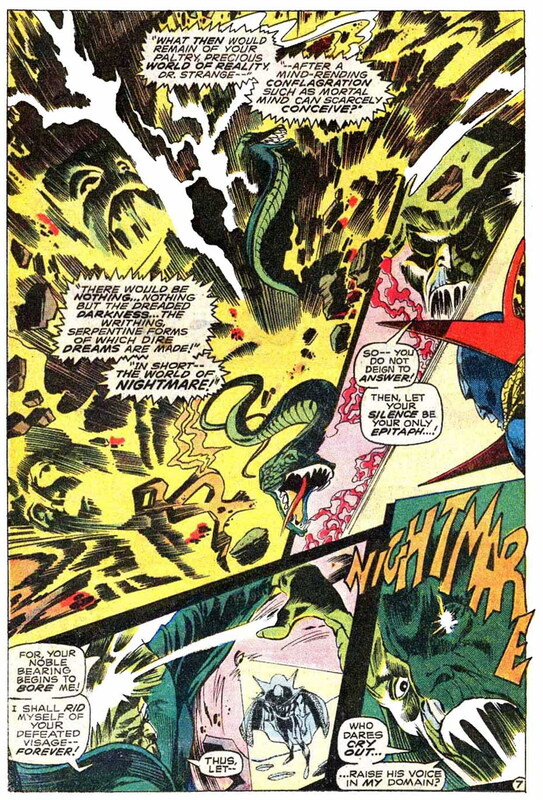 Panel from Nightmare’s first appearance in Strange Tales #110. 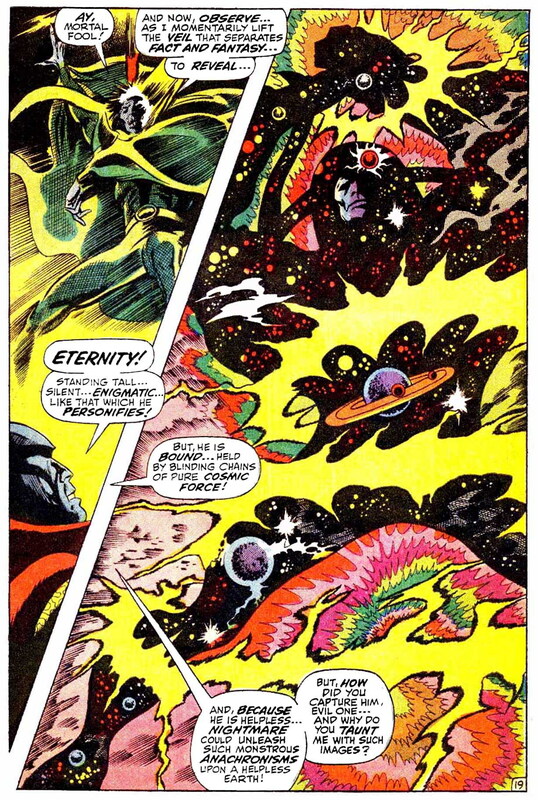 Panel from Eternity’s first appearance in Strange Tales #138. 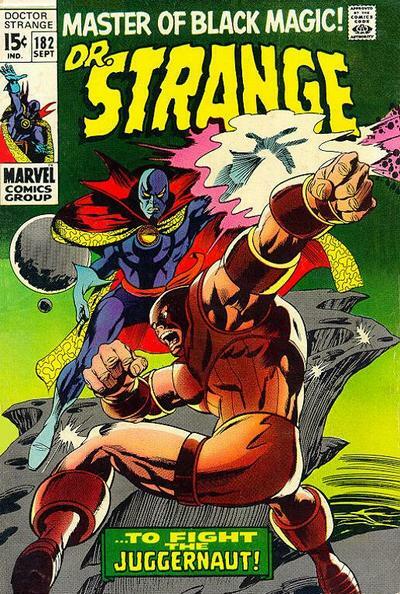 Having scripted a few “Doctor Strange” stories during the character’s Strange Tales days, Roy Thomas had settled in for an extended run with the sorcerer-hero’s first solo issue, #169. 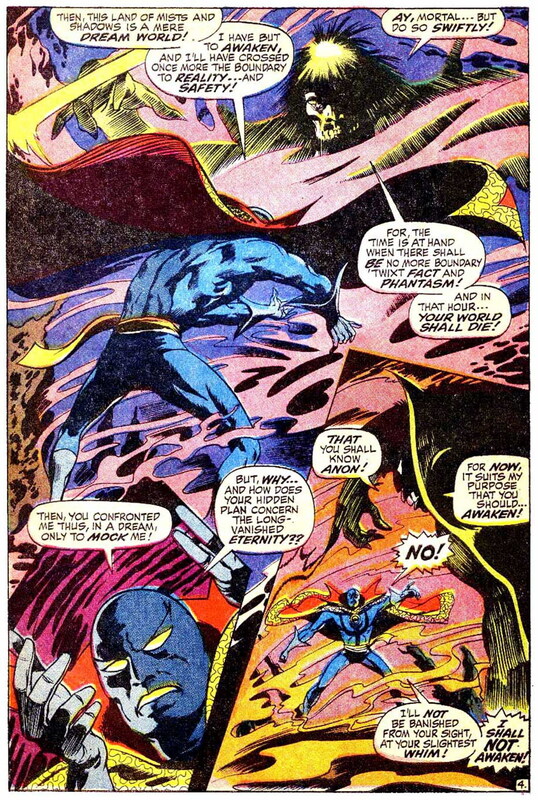 Early on, he’d relied heavily on Strange’s established roster of villains, including Nightmare (who’d first appeared in the Doc’s debut adventure in Strange Tales #110, making him the Master of the Mystic Arts’ oldest foe), Dormammu, and Umar, before moving into an extended storyline featuring a new menace, the Sons of Satannish. 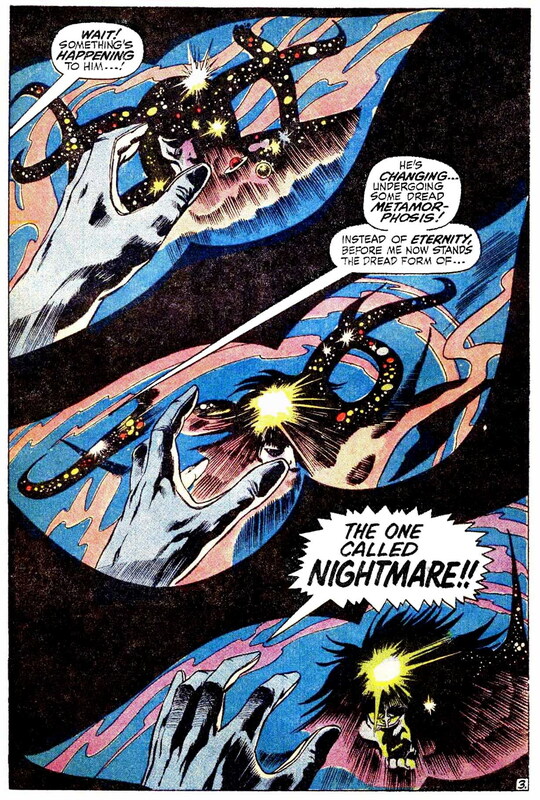 Now, after making brief use of an old, minor villain (Tiboro, whose first and only previous appearance had been in Strange Tales #129) in issue #178, Thomas was diving back into the feature’s history in a big way — bringing back not only Nightmare, but also another classic Ditko-Lee character who hadn’t been seen since the multipart storyline that was the climax of that creative team’s run, Eternity. 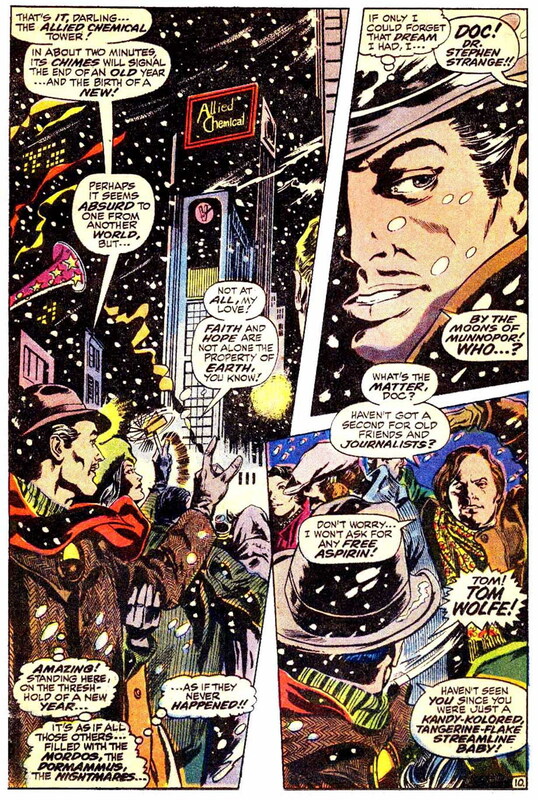 “…It’s New Year’s Eve!” The story’s being set on this specific day would have made all the sense in the world if it had come out in early January, as it was originally supposed to; as it happened, however, it was more than a month late in ringing in 1969 (something that Marvel felt compelled to apologize for/explain in this issue’s letter column, adding, “That’s just to let Marveldom Assembled know that Stan, Roy, and Gene don’t actually believe that New Year’s Eve falls on Groundhog Day!”). 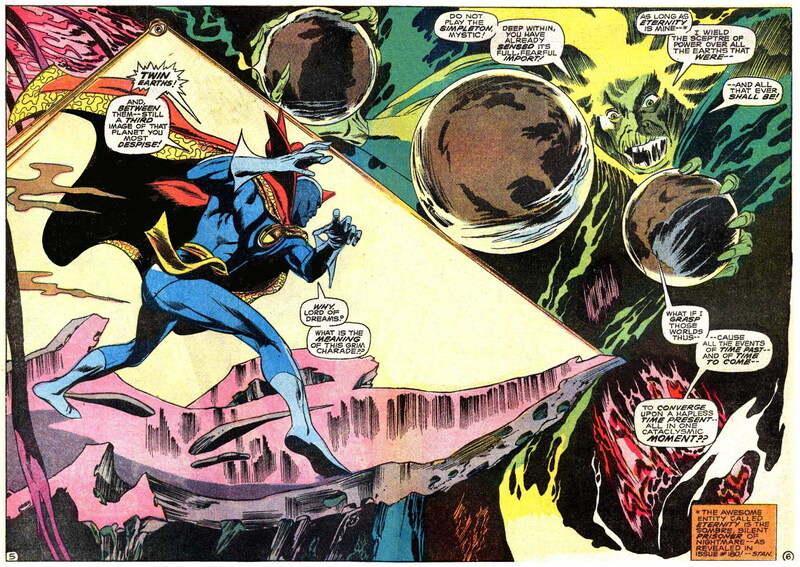 As noted in his Marvel Masterworks – Doctor Strange, Vol. 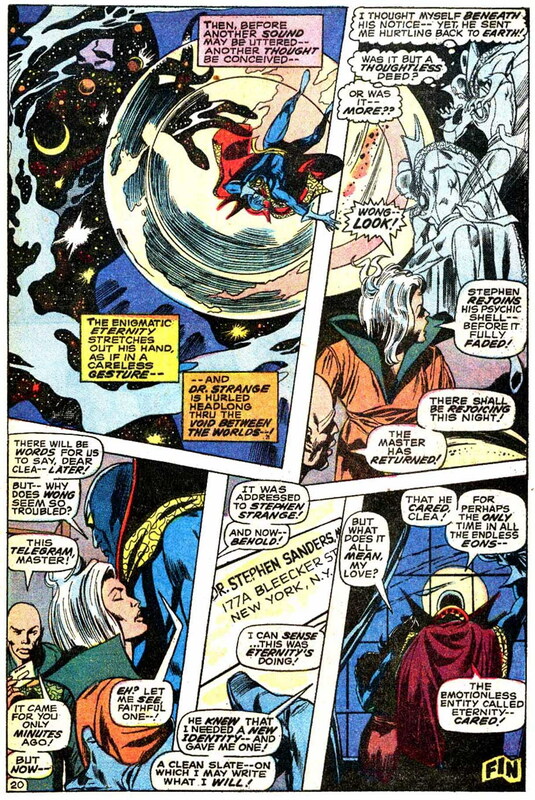 4 intro, Thomas welcomed the opportunity that Stephen and Clea’s night out gave him for writing some less formal dialogue for his protagonist, of the sort that he hoped “would further humanize the Master of the Mystic Arts.” I believe he was successful, at least as far as my eleven-year-old self was concerned. 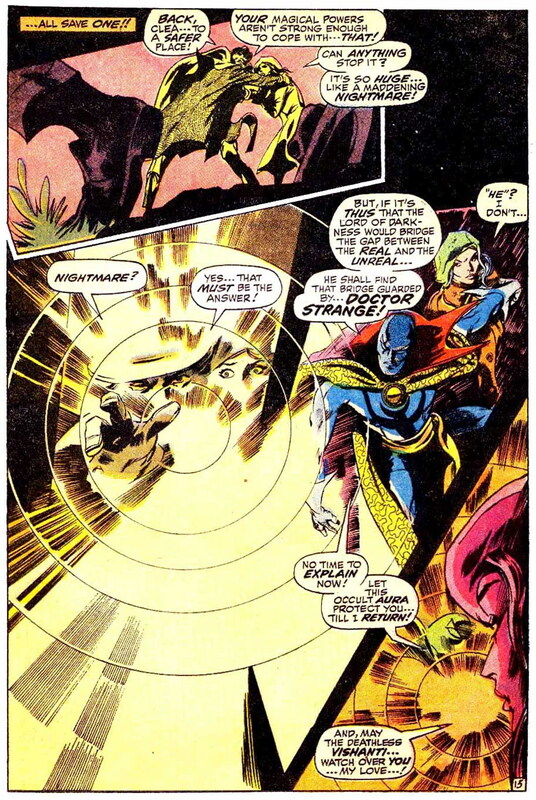 While I didn’t necessarily consider Stephen Strange to be a “regular guy” after reading this story, I think that I did find him at least somewhat more relatable, going forward. 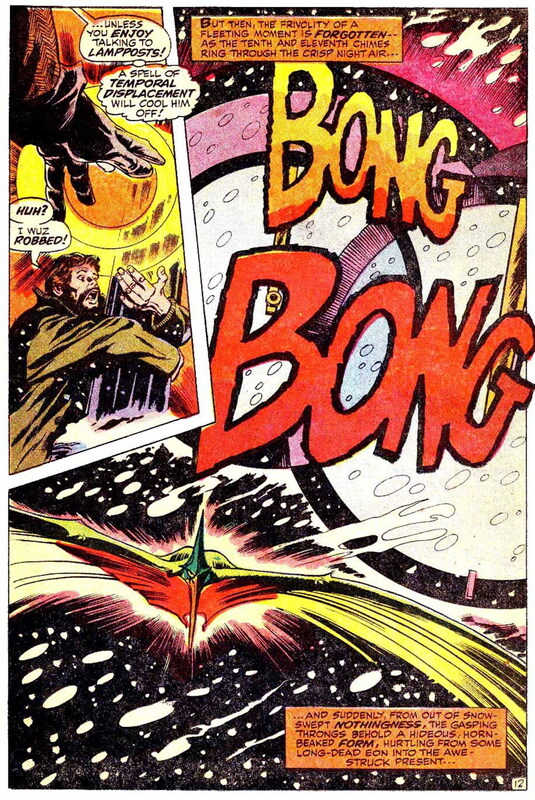 Why Doctor Strange? 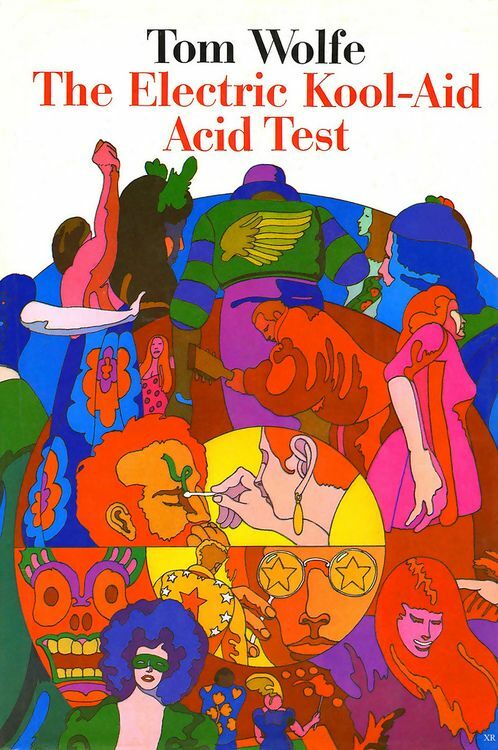 Mostly because Wolfe had name-dropped the character multiple times in The Electric Kool-Aid Acid Test, his 1968 nonfiction book about author Ken Kesey and his band of fellow LSD enthusiasts, the “Merry Pranksters”. 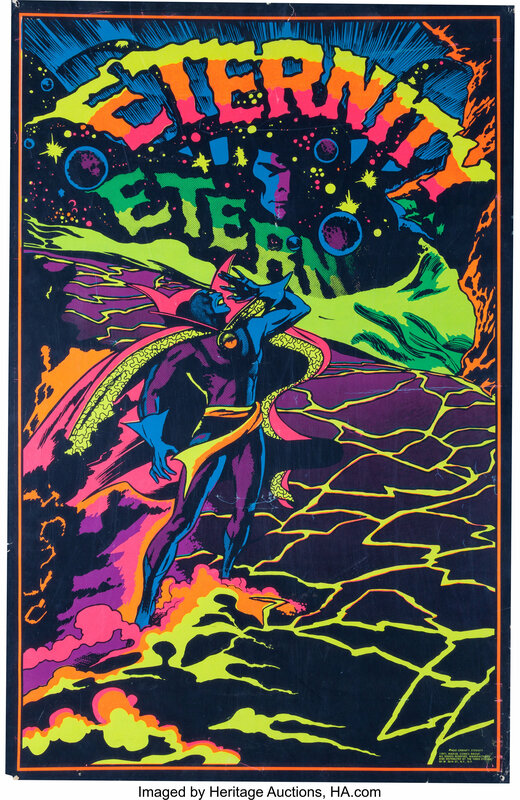 Along with a number of concert posters and record album covers that incorporated Marvel’s magician into their psychedelic graphics, the affinity of Kesey and his followers for “the plunging purple Steve Ditko shadows of Dr. 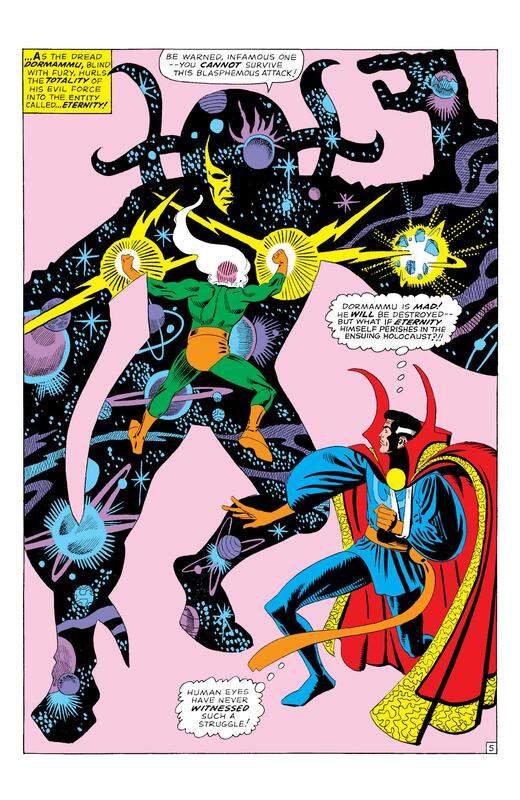 Strange attired in capes and chiaroscuro” was a major signifier of the Doc’s rather surprising cachet within the late Sixties counterculture — a deeply ironic development, considering the conservative views and lifestyle of his primary creator, Steve Ditko, whose surreal other-dimensional visions had come straight out of his imagination, no hallucinogens required (or desired). 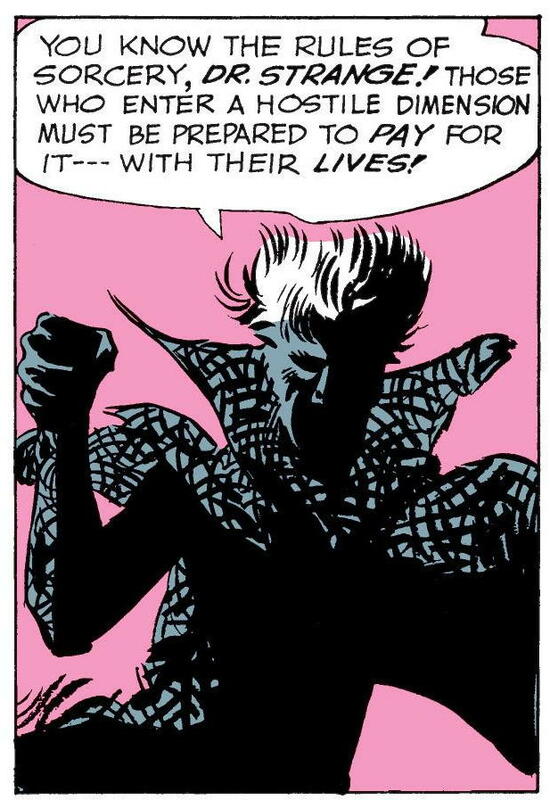 As things turned out, it would be a longer wait than expected for the next chapter in the Nightmare/Eternity storyline. 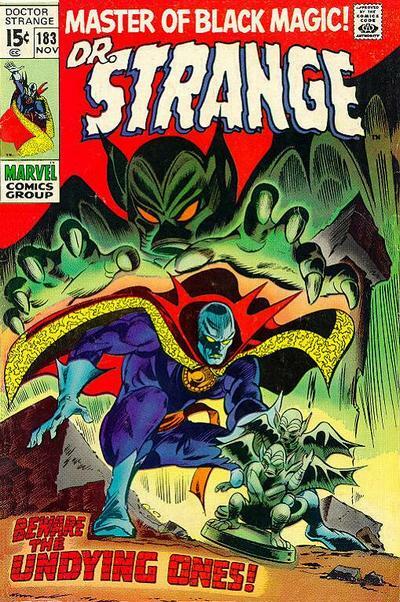 Marvel’s attempts to make Doctor Strange more attractive to superhero fans might have worked on me, but evidently not on enough other comic book buyers to significantly improve sales — and so, the title dropped to bi-monthly following issue #180; and I had to wait until April, 1969 to see Doc travel into the “Stygian world” of Nightmare to face “the loathsome living gauntlet” the villain had promised lay in wait. 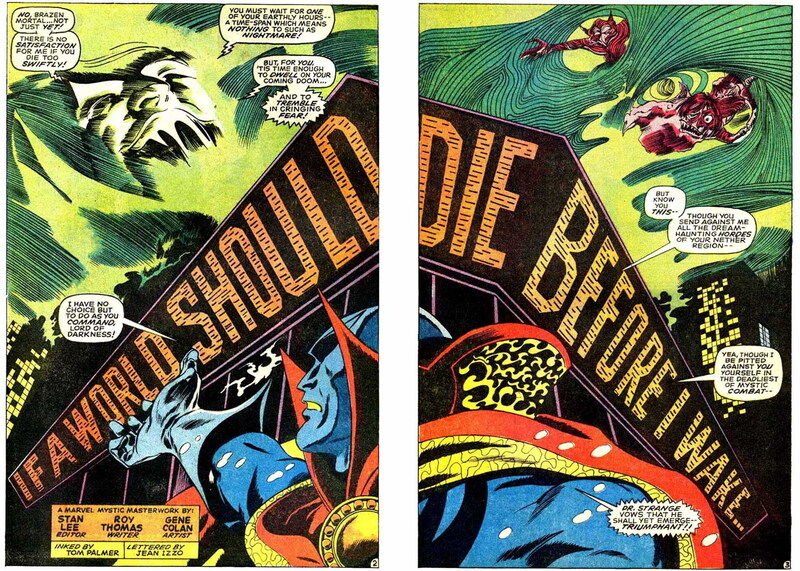 “You must wait for one of your earthly hours –“? What the heck? Talk about delayed gratification! 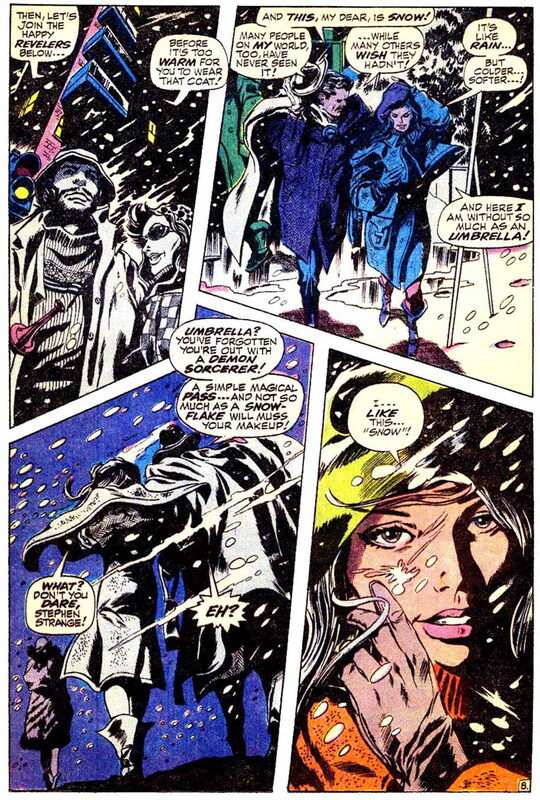 Over the next nine pages — almost a full half of the issue — we’re given an extended recap of the previous issue’s events, followed by a brief, mildly humorous interlude with Stephen, Clea, and a couple of snowball-throwers (which plays out along much the same lines as the “kiss the lamppost” bit in #180), and finally, some hand-wringing with Wong and Clea back at the Sanctum Sanctorum, just before the sands of time run out on the allotted hour. 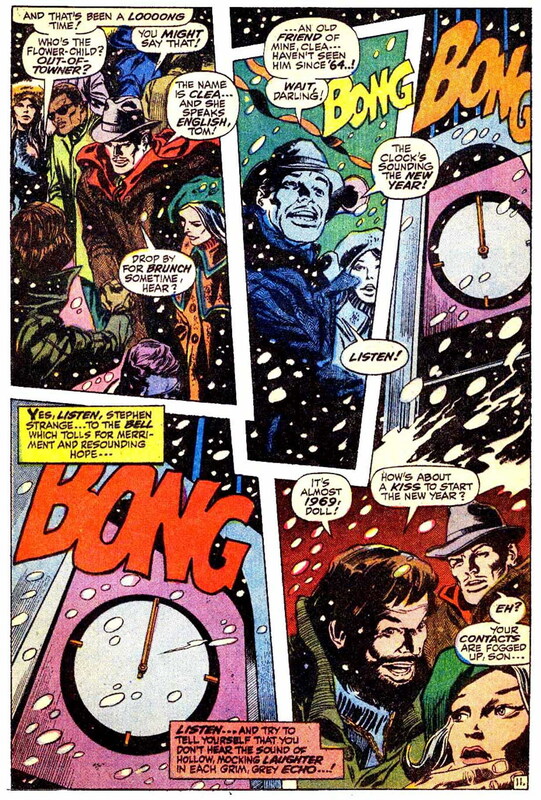 Nothing that happens– with the minor exception of some suspicious mutterings from the Times Square crowd our hero’s just saved (“Who’s that costumed kook with the fright-mask?” “We’ll remember that name — Dr. 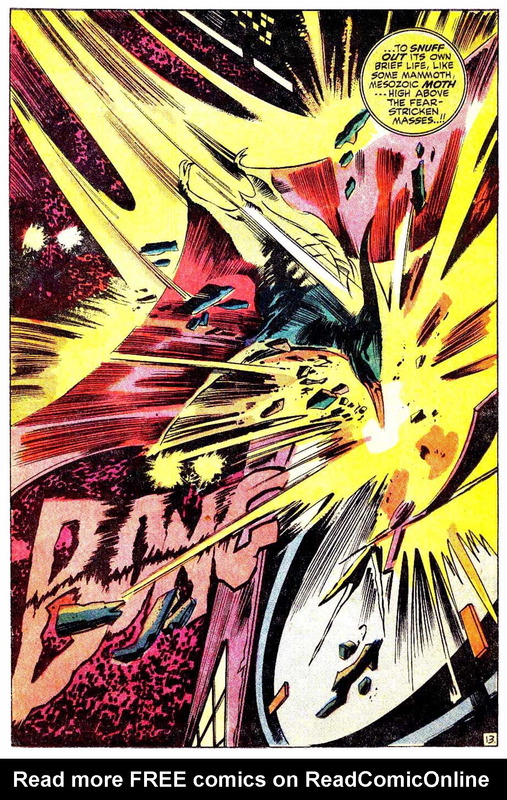 Strange!“) — does anything to advance the plot; and while Colan and Palmer’s rendering of it all is a pleasure to look at, it’s hard to escape the feeling that this one-hour delay is just a way to pad the story out so it can run for a whole three, as opposed to a measly two, issues. 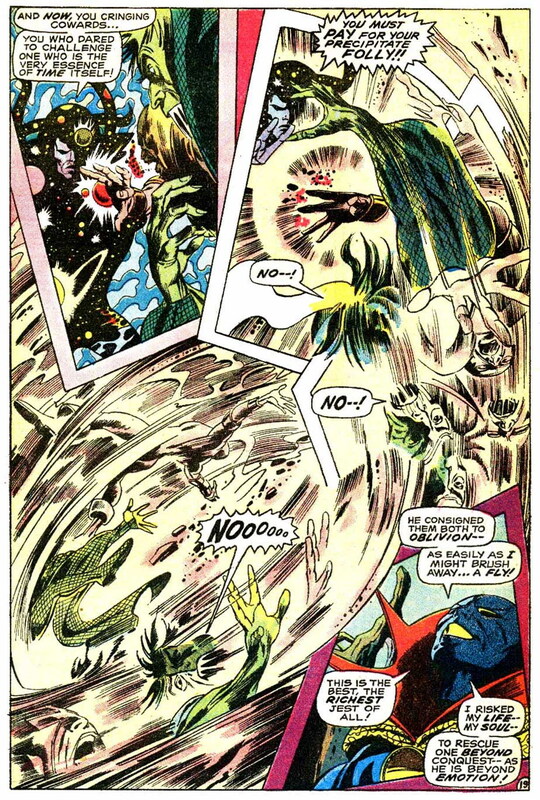 Page 19 further showcases Colan’s innovative approach to page layout, as the “sickly, emerald-hued film” of Nightmare’s spell oozes out from the Eye of Agamotto to form the page’s panel borders. 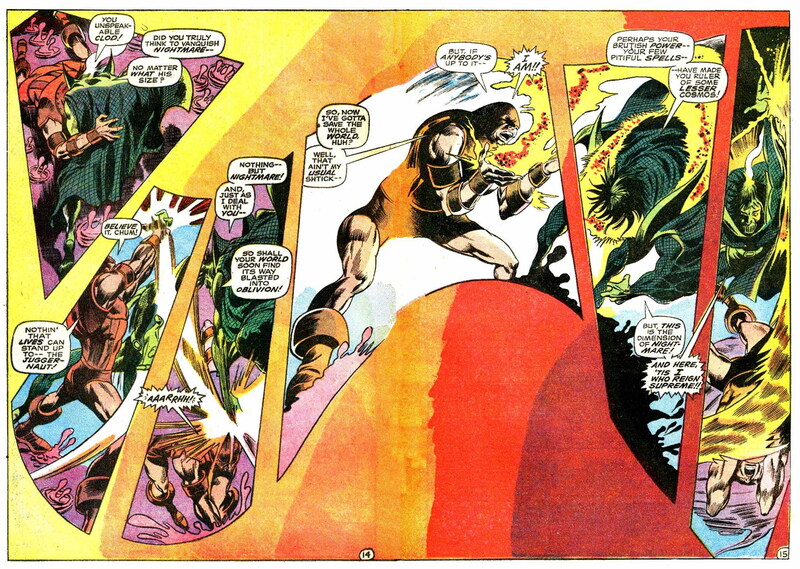 Colan’s use of such techniques has the effect of making many of his pages (including this one) strike the eye as single, unified graphic designs as much as (or even more than) as sequences of distinct, if related images; such pages mightily resist being broken down into their constituent panels. 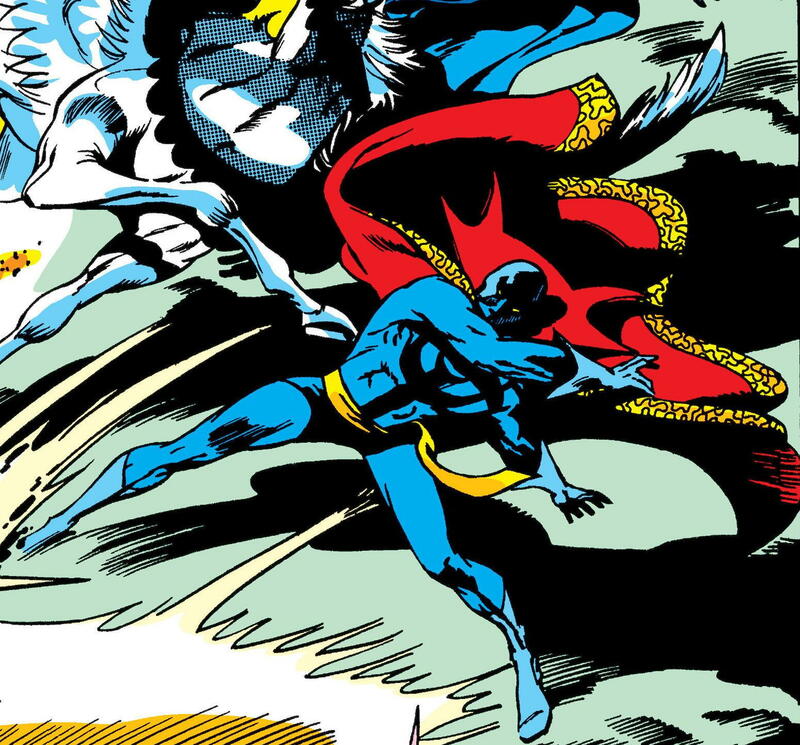 The conclusion of issue #181 left things looking pretty bad not just for the Master of the Mystic Arts, but for all of us poor mortals here on the Earthly plane. Thankfully, we all managed to hang on for another couple of months, until June, 1969 at last brought us the third and concluding chapter of the story. 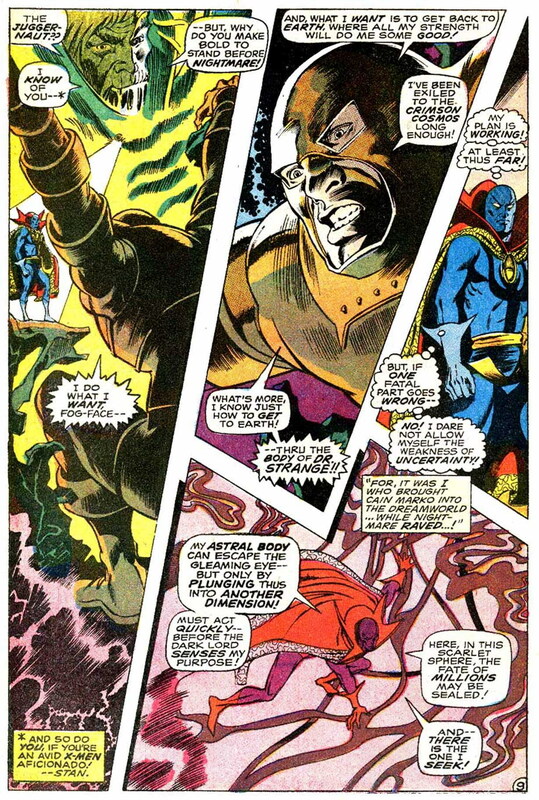 Cain Marko, the Juggernaut! 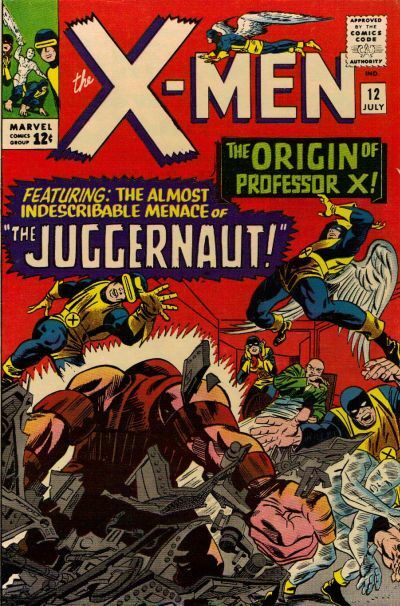 Neither of those names really meant anything to my eleven-year-old self in 1969 — mainly because I wasn’t much of an X-Men fan (yet), and as an editorial note on the next page would inform me, that series was where the character had originated. 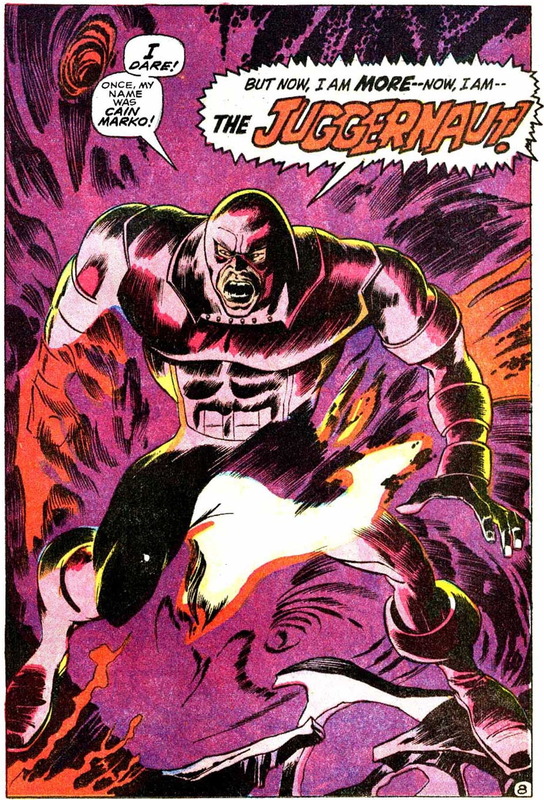 The Juggernaut’s appearance here is an example of Roy Thomas’ penchant for bringing characters and concepts established elsewhere in the Marvel Universe into whatever book he was currently working on, whenever they seemed to fit. 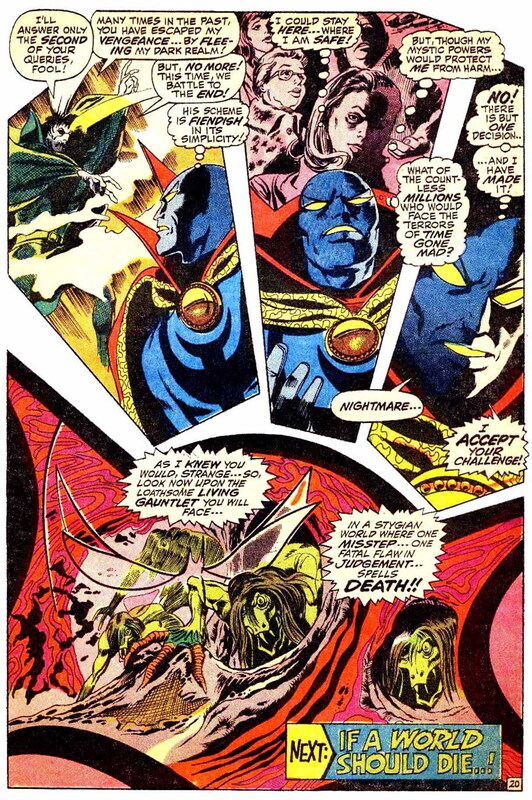 He’d done the same thing recently in the “Sons of Satannish” multi-issue storyline that had preceded this one in Doctor Strange (and also crossed over into Avengers), hauling in Ymir the Frost Giant and Surtur the Fire Demon from Thor. 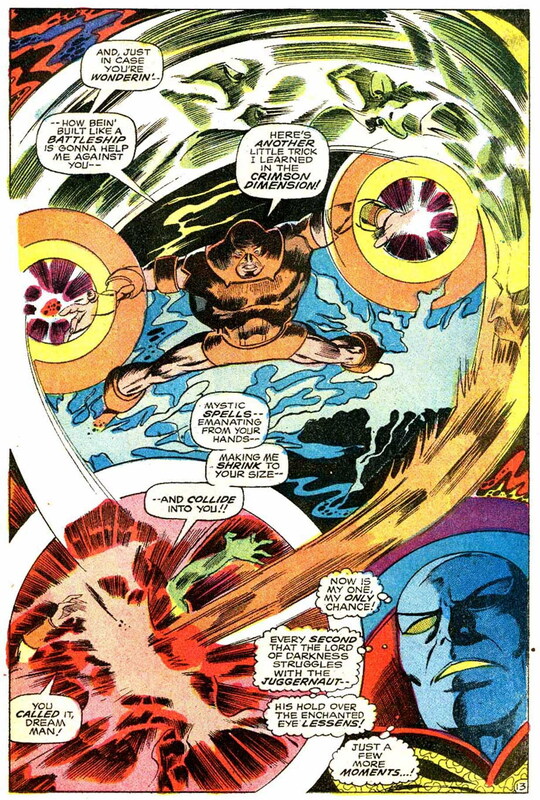 Of course, one could argue that the Juggernaut had more business showing up in Dr. Strange’s book than had those two Norse mythological menaces, since there’d been an explicit, if indirect connection made between this “mutant-adjacent” powerhouse and the Master of the Mystic Arts in the very comic that introduced the former, in X-Men #12 (July, 1965). 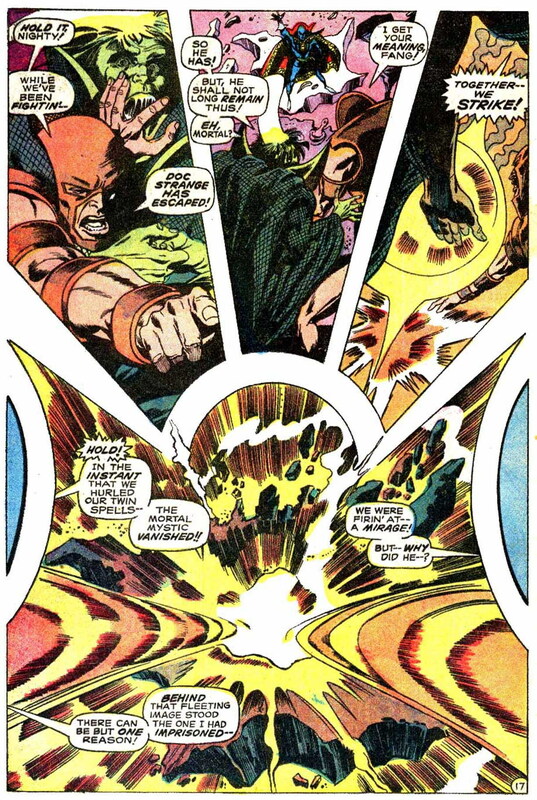 As related in that issue’s story by Stan Lee and Jack Kirby, Cain Marko received the powers of “a human juggernaut” from a mystical ruby he discovered in a temple dedicated to the entity Cyttorak. 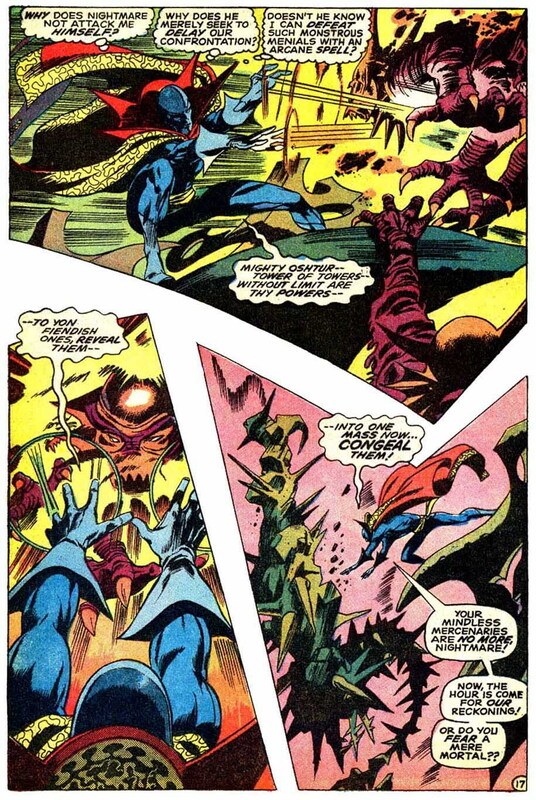 “Cyttorak” was a name Lee had introduced in a “Doctor Strange” story published in Strange Tales #124 (Sept. 1964), where he had Doc invoke “the Crimson Bands of Cyttorak” as part of a spell. 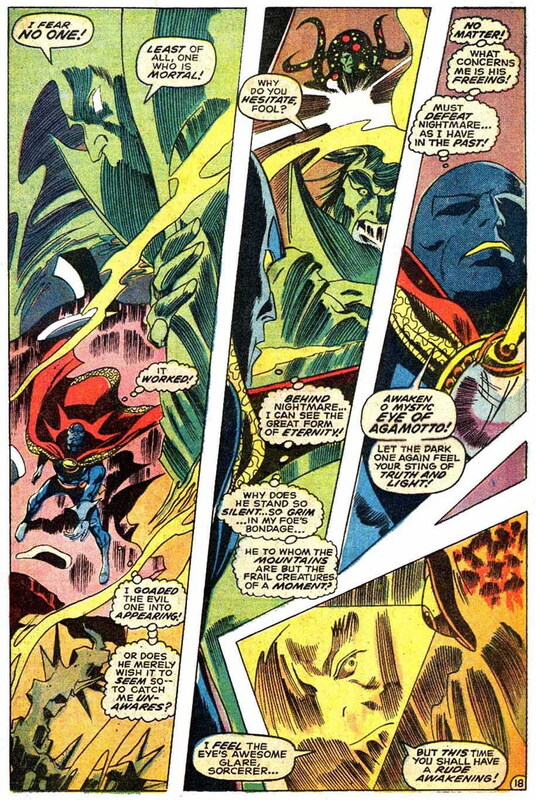 It seems likely that, nearly a year later, Lee found himself needing the name of a mystic entity for his and Kirby’s X-Men story, and figured that “borrowing” one from “Doctor Strange” was easier than coming up with a new one — plus, it helped serve the larger purpose of weaving the various titles in Marvel’s line into a coherent fictional universe. 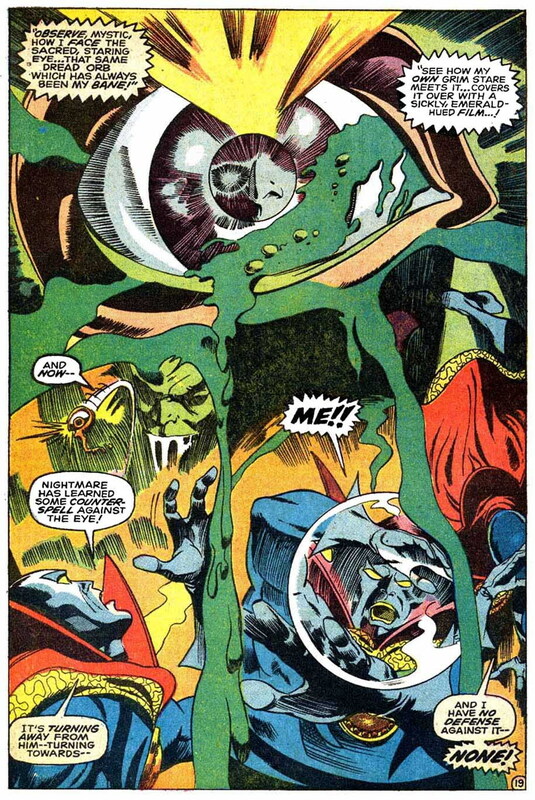 While the two villains battle, our hero takes advantage of Nightmare’s distractedness to free his Eye, and then himself, from the latter’s mystical control. 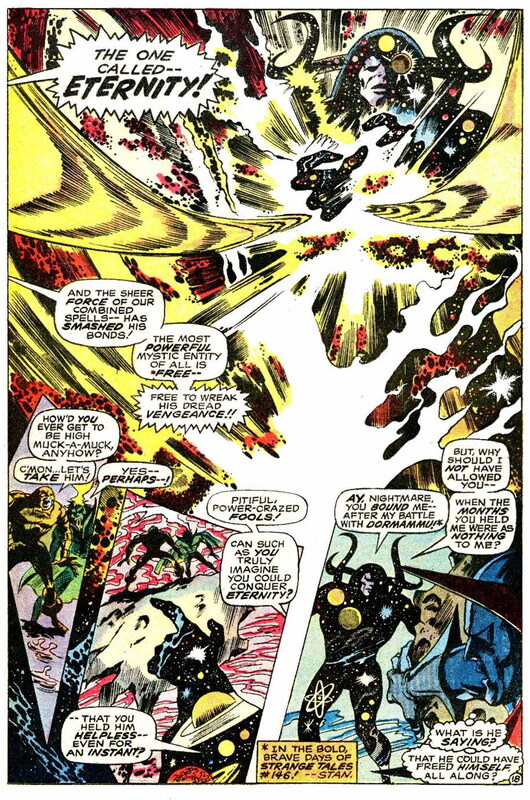 “He consigned them both to oblivion –” Well, Steve, I know it looks that way, but I guess Eternity must have a streak of perversity somewhere in his anthropomorphized body, because he didn’t do anything so permanent that neither Nightmare nor Cain Marko couldn’t find their way back from it, given a few years’ time. 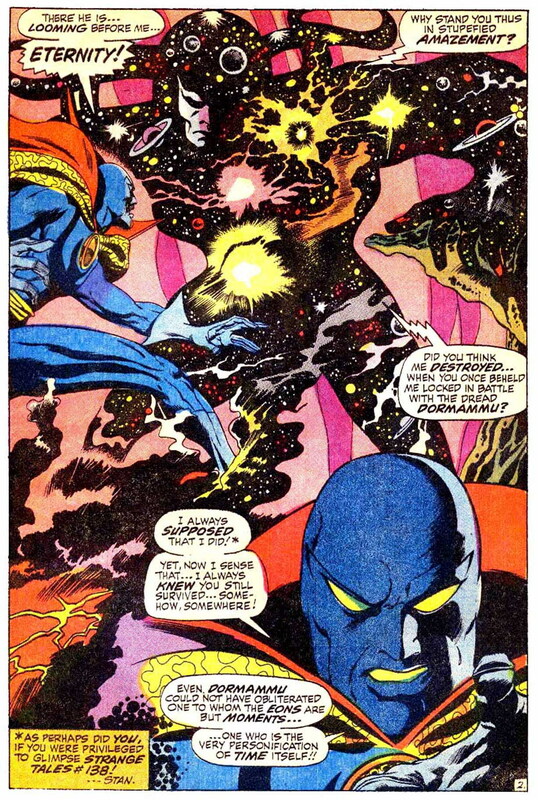 And while it may have seemed ridiculous in 1969 (at least in retrospect) to imagine that anyone could possibly keep “one who is the very essence of time itself” in chains, eventually a later Marvel writer did manage to imagine just that (as readers of Al Ewing’s The Ultimates may remember). 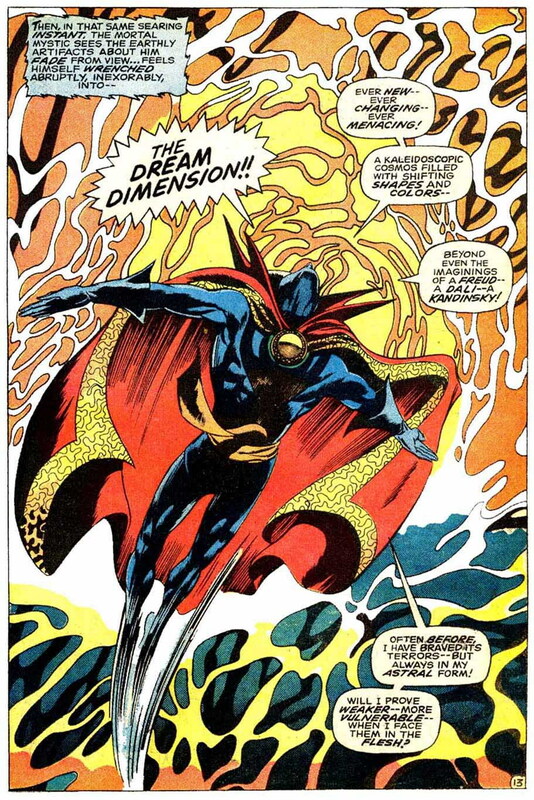 And with that, Roy Thomas’ “superheroization” project with Doctor Strange is complete, as, for the first time, the Master of the Mystic Arts gets a “secret identity”. 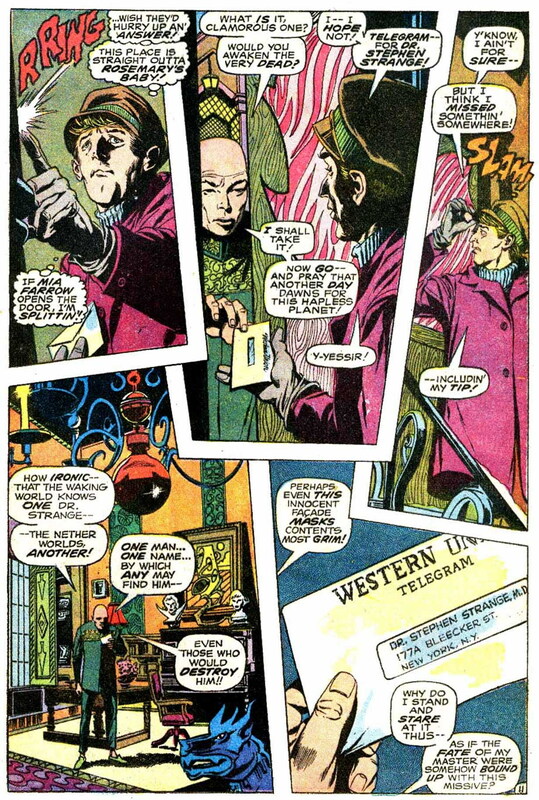 Henceforth, the former surgeon who takes his telegrams (and presumably his mail) at 177A Bleecker Street will be known to all and sundry as Dr. Stephen Sanders. As for “Dr. Strange”? 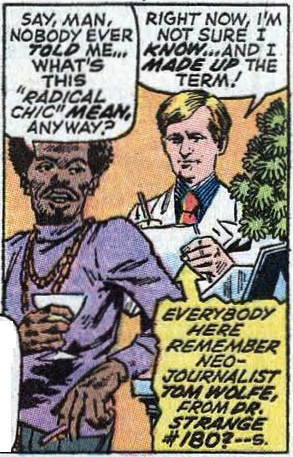 From now on, that moniker might as well be — well, a made-up name. That’s how it was supposed to go, at any rate. 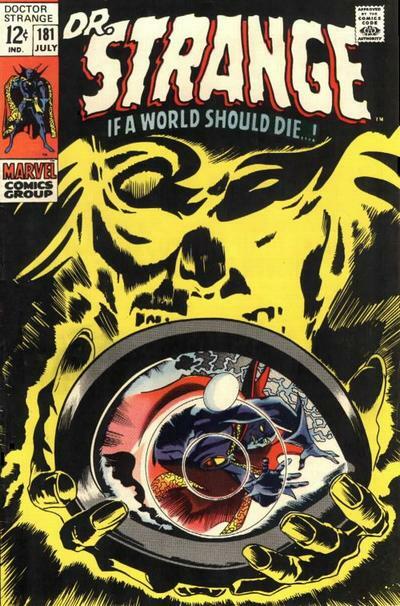 Unfortunately, the very next issue, #183, would prove to be the last of the series. 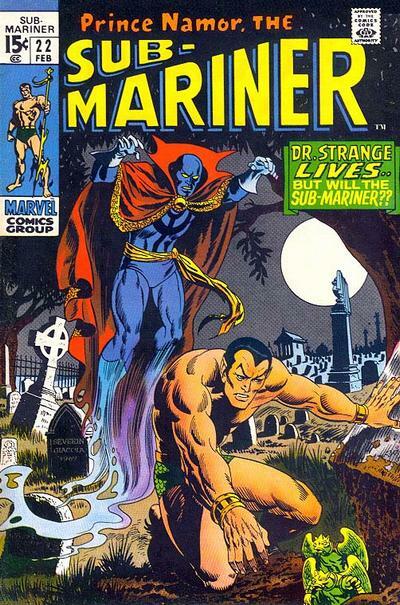 Neither Thomas’ tinkering, nor Colan and Palmer’s superb art, nor even the drop down to a six-times-a-year schedule were enough to keep the title off of Marvel publisher Martin Goodman’s chopping block. 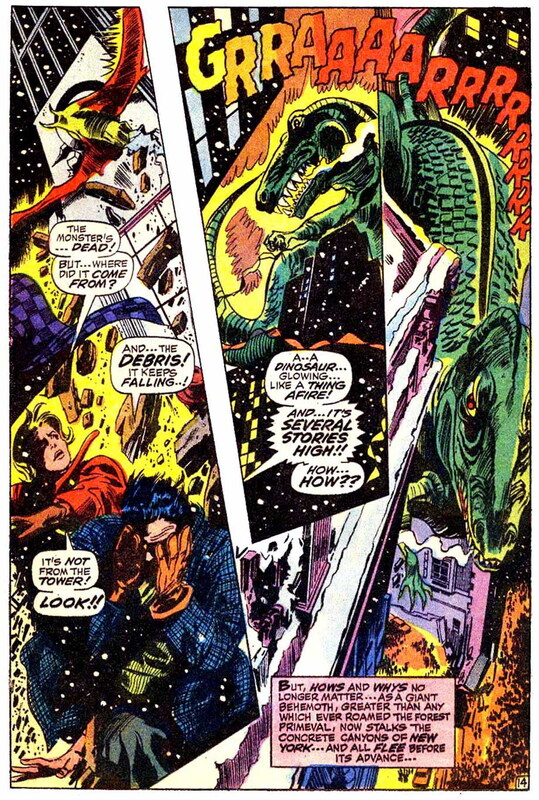 His cancellation decision seems to have been made after the final issue had already gone to the printer, or very near to that, as neither the “next issue” blurb at the end of the story nor the letters column gave any hint that anything was amiss. 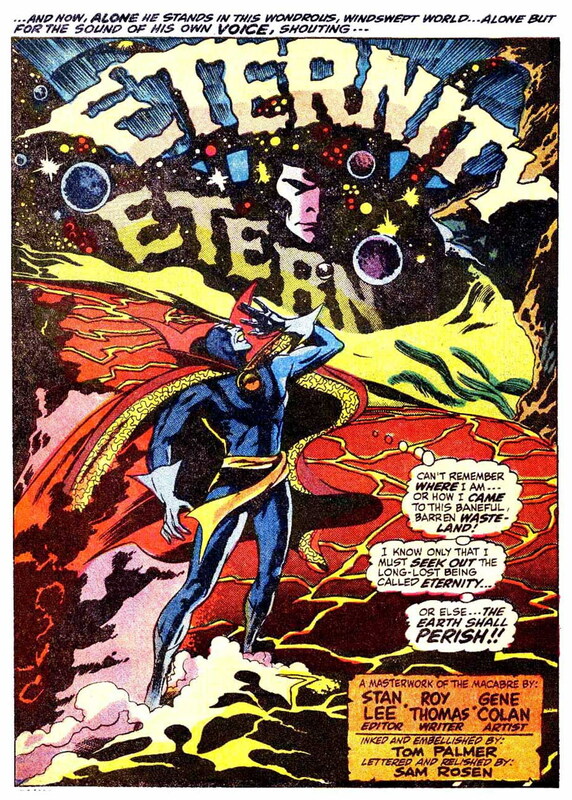 Truth to tell, though, I didn’t learn such specifics of how Doctor Strange had ended its run until a considerable time later, as my by-then twelve-year-old self missed #183 when it came out in August, 1969. 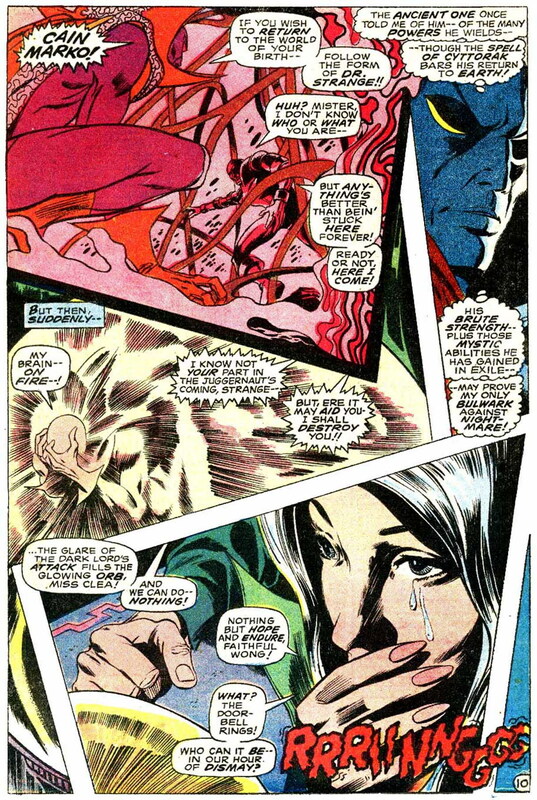 So I didn’t even get to find out who that mysterious telegram was from, darn it — at least, not until I managed to score the Thomas/Colan/Palmer team’s swan song as a back issue, several years down the line. 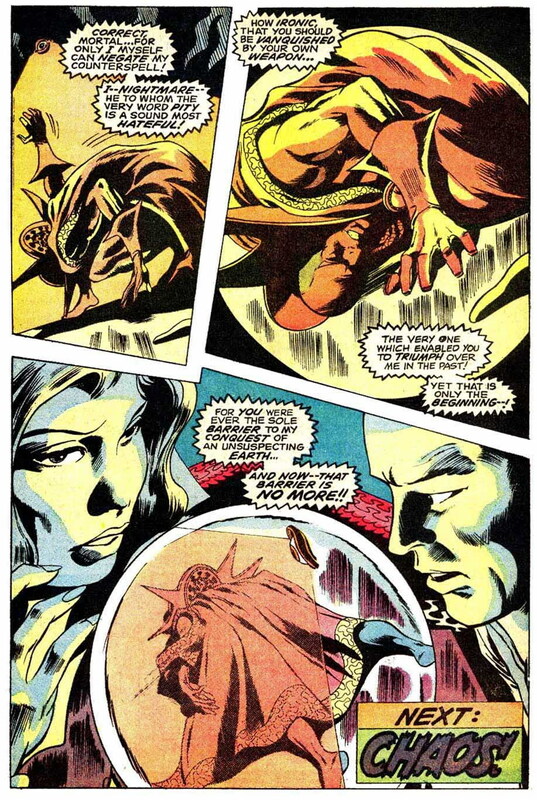 On the other hand, I did get to pick up on the storyline that said telegram kicked off, which was so abruptly cut off with the demise of Doctor Strange’s titular series — because Roy Thomas wasn’t one to leave loose plot threads hanging around for too very long. But that’s a discussion that we’ll have to leave for another post, at another time — namely, this November. See you then, OK? 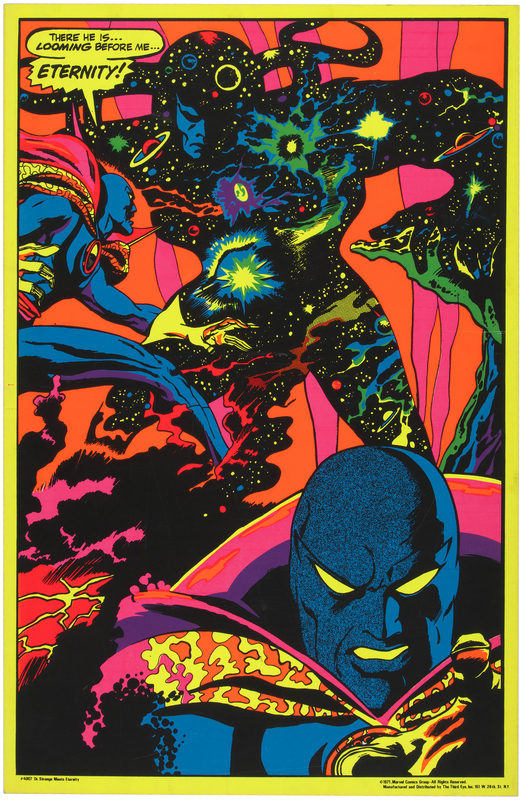 *About two years after Doctor Strange #180’s publication, both the splash and the following page would be adapted into blacklight posters by The Third Eye, along with some 22 other Marvel Comics images — most if not all of which I’d later enjoy staring at for extended periods of time on my semi-regular visits to the “blacklight room” in my hometown mall’s record store, back in the early Seventies. And no, I wasn’t high at the time (he admitted with some regret). 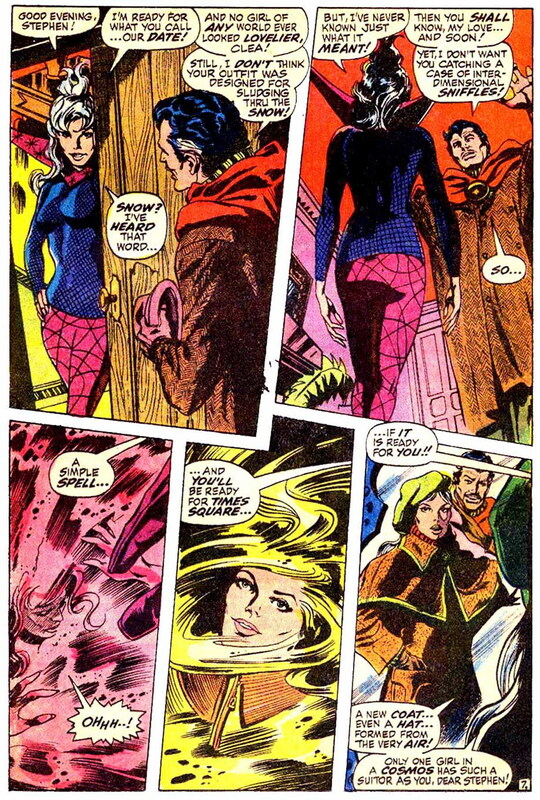 As for your comment about psychedelic substances, wait until Englehart’s 70s run; apparently he and Frank Brunner (and Kupperberg, Weiss, and a few others) used to indulge from time to time and wander around Lower Manhattan getting story inspiration. 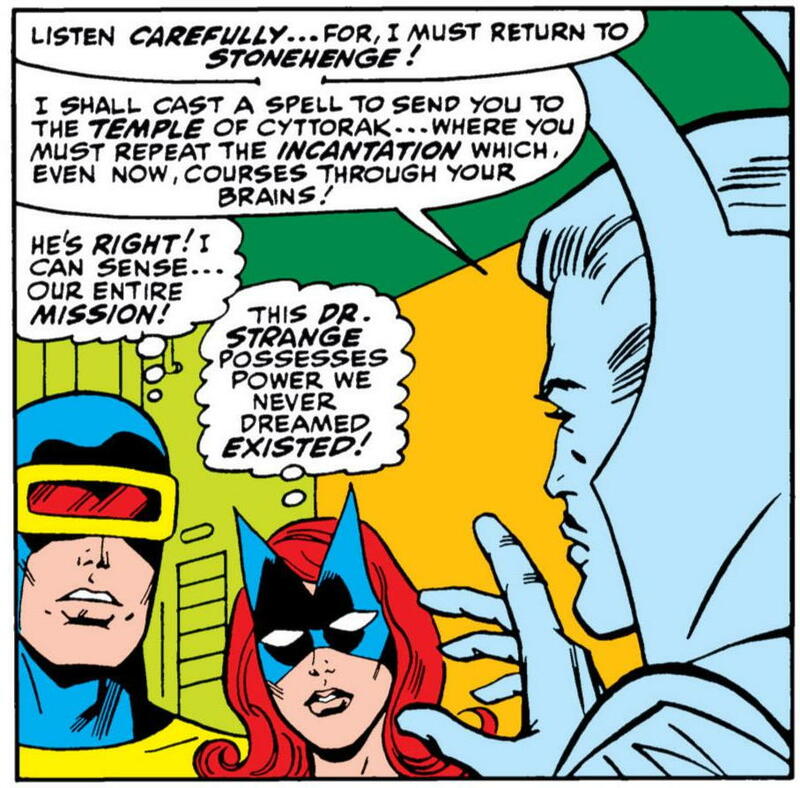 The Doors of Perception were opened, I guess.